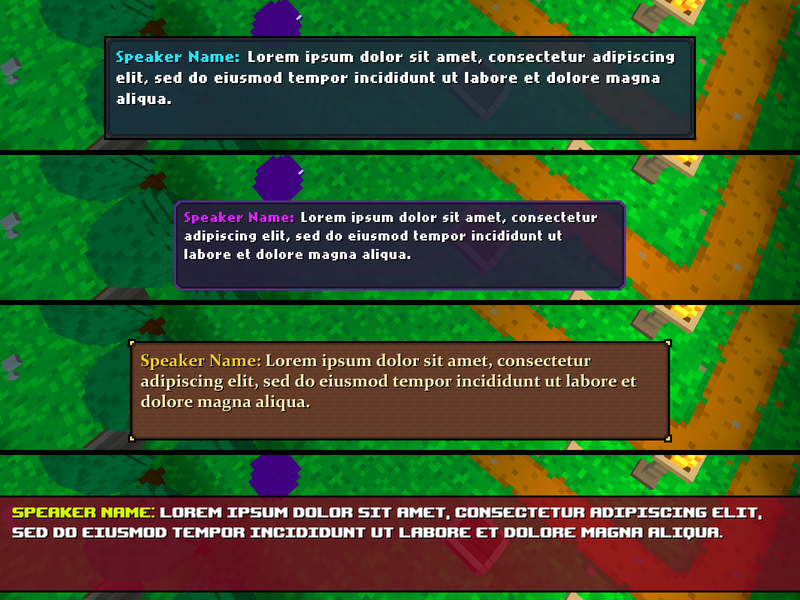 One of the primary areas I have been focusing on recently is around customization of the dialogue box appearance. I’ve been adding some new options and features to the UI Theme Editor that allow you to design unique dialogue box styles that best suit your game. It’s still a work in progress, but check out a few of the many styles that you can create with the available options! Using the new file dropping functionality, you can drop a TrueType font file into the application which can then be selected from the Properties panel while editing your theme. Previously, in regards to the dialogue box itself, you could only change the colors of the box. 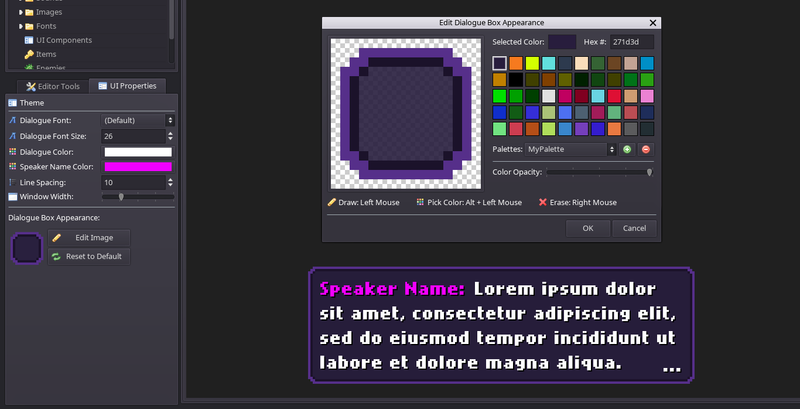 With the new image editor, you can now draw a custom image for the box as desired (including transparency). Some of the currently available customization options include font, font size, and font color, window width, and vertical line spacing. As shown below, these tweaks can make a big difference in the overall appearance of the dialogue box. I decided it would be beneficial to put some effort into features like this earlier on. I’d like to enable people to create more unique styles and to not be stuck with one default dialogue box style. My goal is to include a lot of flexibility and customization like this, while still providing built-in options for those who aren’t interested in modifying aspects like the UI. Here’s a great example showing how simple it will be to change the dialogue box appearance to something quite different from the default style! One other small update worth mentioning is the addition of a new scripting function, “Move Character”. This function will move an NPC to a specific target tile as shown in the GIF below. This works similarly to the existing “Move Player” function, and should be useful for cutscenes where you would need NPCs, for example, to move to a different room or over to a particular object. Thanks so much for reading and for the support!